Join us as we connect art with a scenic drive through our beautiful county. A Barn Quilt is a painted quilt square mounted on the side of a barn or other structure. It can be a business, a home, an historic property, a shed, or any structure. It can be a traditional pattern or a one-of-a-kind design. It is meant to grab the attention of people driving by the property and help to share more about the past and present of Franklin County. How big are barn quilts? It depends on how close the road is to the property with the square. They range in size from 8’×8’, 4’x4’ or 2’x2’. Smaller barn quilt squares can be mounted on sigh posts, which makes hosting the quilt square quite flexible. It is a collection of painted quilts that help local residents and visitors to explore Franklin County in a different way. It also pays tribute to the importance of farms and farming in Franklin County—past and present, while hoping to secure the future of farm and farmland in Franklin County. 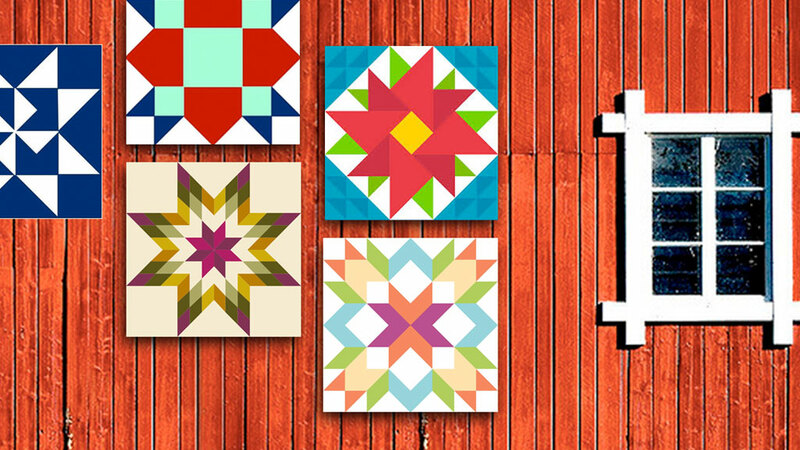 Why host a barn quilt square and be part of a barn quilt trail? Celebrate local history and culture. How can I get involved in the Stitches in Time Barn Quilt Tour? Contact the Franklin County Visitors Bureau at 717.552.2977 or 866.646.8060. Download the application to get started and submit to the Franklin County Visitors Bureau by emailing jpollard@ExploreFranklinCountyPA.com. Or drop/mail the form to the Franklin County Visitors Bureau, 37 South Main Street, Chambersburg, PA 17201.